he ended the afternoon perched on a table with a torch under one armpit whilst he busied himself with pencil and paper sketching a Pholcus on the ceiling. Bristowe seemed to have a particular fascination with Pholcus phalangioides, the daddy long legs spider. The eggs may hatch in two or three weeks' time and the young then hang motionless like washing on clothes-lines for the next week or fortnight during which time they take no notice of any disturbance such as those caused by their mother catching an insect. 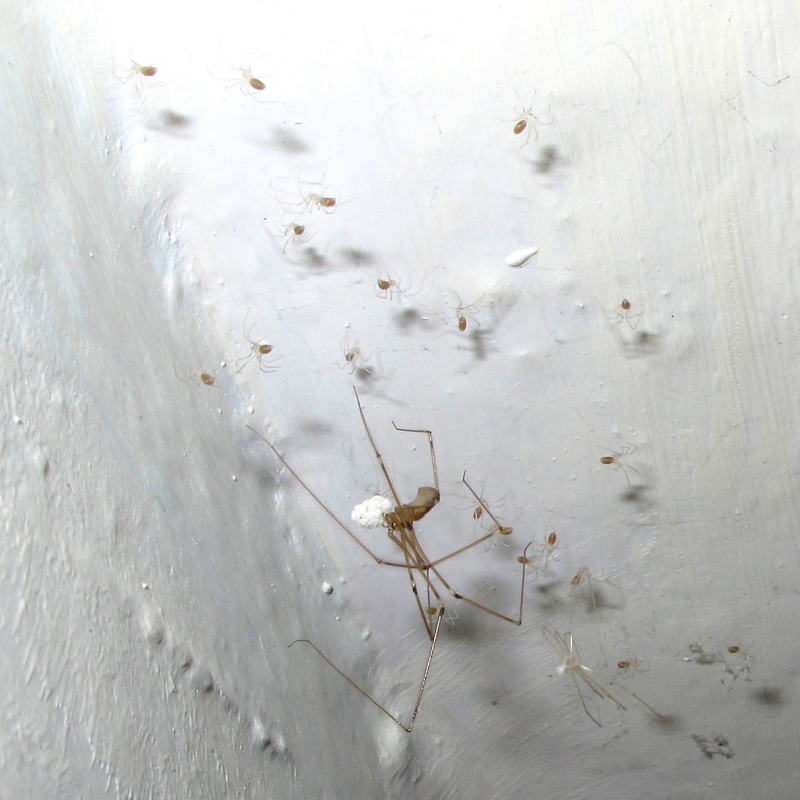 Unlike nearly all other spiders, they do not molt until after they have emerged from the egg-sac. Directly they have recovered from this first molt they gradually begin to migrate, taking positions further and further along the wall and spacing themselves as though they had staked their claims to particular territories. Now they are interested in food and for several of them their first meal is of a brother or sister who is backward in his timetable of who dies or is injured as a result of the delicate operation of moulting. A couple of days ago the spiderlings moulted and today, at the tender age of 12 days, some more adventurous spiderlings have started to explore and disperse away from their mother, their old skins hanging like ghostly gloves from the invisible web. Bristowe, W.S. 1958. The World of Spiders. The New Naturalist. Collins, 304 pp. Great stuff. I think i ahve a copy of that book. I must finish reading it!